Norio Hotta is the leader of a gang of fellow Third Year students who are the reigning delinquents at Shohoku. 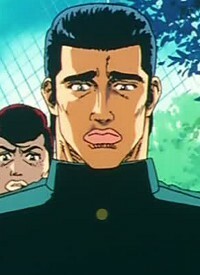 Sakuragi catches his attention on the first day of school when he gets into an altercation with two of his cronies, resulting in his issuing a direct challenge to Sakuragi by interrupting one of his classes. Before Sakuragi and his Gang arrive, Hotta and his cronies run into Rukawa on the school roof, who singlehandedly knocks out all four of them. Hotta is a good friend of Mitsui, and backed him up when he challenged Miyagi to a fight a year ago. He and his friends provide the muscle again after Miyagi returns, and they join Mitsui in his attack on the basketball team. From Kogure's revelation of Mitsui's prior history with basketball, Hotta realizes that Mitsui deep down wants to play again, and is persuaded by Sakuragi's Gang to share the blame with them for attacking the team, getting the team off the hook for fighting. It should be noted that though Hotta and his friends failed to win in fights against Sakuragi's Gang or even Rukawa, they are portrayed as among the best fighters in Shohoku. Hotta and his cronies later become supporters of the basketball team during the National Championship Tournament (though even they get scared by the aggressiveness of the Toyotama crowd), largely because of their friendship with Mitsui, who they give the epithet Honoo no Otoko (lit. "Flaming Man").